The pomegranate is an ancient fruit, originally native to the Middle East. The fruit is about the size and shape of the average orange, but its skin has a pinkish-red hue and a leathery texture. The inside of the pomegranate is filled with bitter, inedible tissue that holds hundreds of sacs containing red or pink pulp and juice. The sacs taste both tart and sweet and are usually eaten raw. Vitamin C is the most abundant vitamin found in pomegranates. This vitamin, also called ascorbic acid, is a powerful antioxidant that rids the body of free radicals, which are unstable oxygen molecules that attack healthy tissues and contribute to numerous diseases and illnesses. Vitamin C is also essential to the production of collagen, a fibrous protein needed in bones, cartilage, muscle and skin tissues. 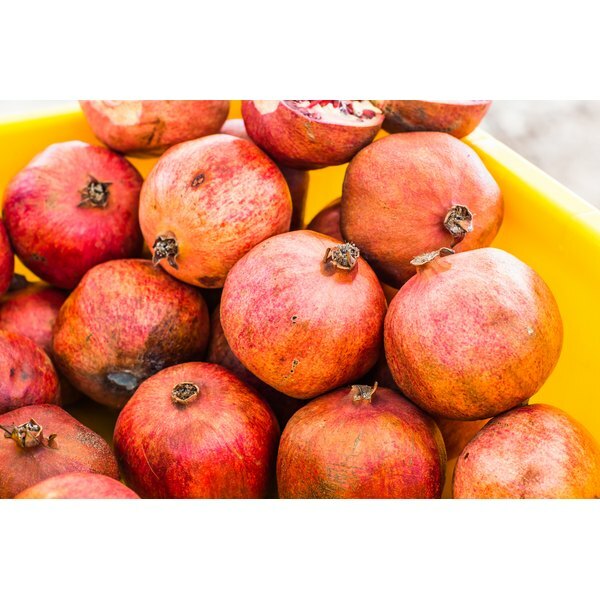 According to the U.S. Department of Agriculture's Food and Nutrition Information Center (FNIC), one pomegranate of a 4-inch diameter contains 28.8 mg of vitamin C.
Pomegranates are a folate-rich food. Folate, also known as folic acid in its synthetic form, is a water-soluble B-complex vitamin. The vitamin is crucial to the healthy growth of red blood cells and good blood circulation and may even protect against certain forms of cancer. Folate is particularly renowned for helping prevent neural tube defects in fetuses. The FNIC reports that a single pomegranate contains about 107 mcg of folate, which is approximately 25 percent of the recommended daily value. Vitamin E, also known as alpha-tocopherol, is a potent antioxidant that offers a number of health benefits to the body. In addition to protecting the body against free radicals, the University of Maryland Medical Center reports that vitamin E helps in the healthy formation of red blood cells, may offer some protection against prostate cancer and, when taken with other antioxidants, can protect against macular degeneration. According to World’s Healthiest Foods, vitamin E is also known to protect against harmful ultraviolet rays from the sun and diminish signs of aging skin. Pomegranates contain 1.69 mcg of vitamin E.